As we enter 2015, the 20th anniversary of the first successful isolation and culture of primate pluripotent stem cells in the world, it’s time to look back and see how far we’ve come. Thanks to a young reproductive biologist who came from the University of Pennsylvania’s VMD/PhD program to the Wisconsin National Primate Research Center at the University of Wisconsin-Madison in 1991, and to those whose research his groundbreaking discoveries informed, the fields of cell biology and regenerative medicine will never be the same. Pluripotent stem cells are right now being used around the world to grow different types of cells—heart muscle cells, brain cells, pancreatic cells, liver cells, retinal cells, blood cells, bone cells, immune cells and much more. Cultures of these cells are right now being used to test new drugs for toxicity and effectiveness. More and more of these powerful cells are right now moving out of the lab and into preclinical (animal) trials and early human clinical trials to treat disease. The results are being published in peer-reviewed scientific journal articles on stem cell transplant, injection and infusion, reprogramming, immunology, virology and tissue engineering. Pluripotent stem cells and their derivatives are right now being studied to learn more about reproduction and development, birth defects, and the genetic origins of disease. Embryonic, induced pluripotent, tissue specific (adult), and other types of stem cells and genetically reprogrammed cells are all being used by researchers due to the open and collaborative environment of scientific and medical enterprises in the U.S. and around the world. All of this is happening right now because of discoveries made 20 years ago by researchers at the Wisconsin National Primate Research Center. 1996-Thomson repeats this feat with common marmoset ES cells (Biol Reprod). 1998-Thomson publishes the neural differentiation of rhesus ES cells (APMIS). 2003-WNPRC Post-doctoral trainee Thomas Zwaka achieves homologous recombination with hES cells. A method for recombining segments of DNA within stem cells, the technique makes it possible to manipulate any part of the human genome to study gene function and mimic human disease in the laboratory dish (Nature Biotechnology). 2004-WNPRC Post-doctoral trainee Behzad Gerami-Naini develops an hES model that mimics the formation of the placenta, giving researchers a new window on early development (Endocrinology). 2005- WNPRC scientist Igor Slukvin and post-doc Maxim Vodyanik become the first to culture lymphocytes and dendritic cells from human ES cells (Blood, J Immunol). 2005-WiCell’s Ren-He Xu, who completed his post-doctoral research at the WNPRC, grows hES cells in the absence of mouse-derived feeder cells (Nature Methods). 2006-WiCell’s Tenneille Ludwig, a graduate student/post-doc/assistant scientist through the Primate Center with Barry Bavister, then James Thomson, formulates a media that supports hES cells without the need for contaminating animal products (Nature Biotechnology). Co-authoring the work is another former Primate Center post-doc, Mark Levenstein. 2007-Junying Yu, WNPRC and Genome Center, in Jamie Thomson’s lab, grows induced pluripotent stem cells, or iPS cells. (Science). These are genetically reprogrammed mature cells that act like embryonic stem cells, but without the need to destroy the embryo. 2012-Alice Tarantal at the California NPRC successfully transplants human embryonic stem cells differentiated toward kidney lineages into fetal rhesus macaques. 2013-Qiang Shi at the Texas Biomedical Research Institute and Gerald Shatten at the University of Pittsburgh – and previously with the Oregon National Primate Research Center and Wisconsin National Primate Research Center – genetically programs baboon embryonic stem cells to restore a severely damaged artery. Before all of this happened, we must note that non-primate mammalian embryonic stem cells were first successfully isolated and cultured in 1981, by Martin Evans and Matthew Kaufman at the University of Cambridge, England. That breakthrough occurred almost 35 years ago. Jamie Thomson studied mouse embryonic stem cells in Pennsylvania before working on primate cells. Even before that, in 1961, Ernest McCulloch and James Till at the Ontario Cancer Institute in Canada discovered the first adult stem cells, also called somatic stem cells or tissue-specific stem cells, in human bone marrow. That was 55 years ago. So first it was human stem cells, then mouse, then monkey, then back to humans again. Science speaks back and forth. It reaches into the past, makes promises in the present, and comes to fruition in the future. In every early talk I saw Jamie Thomson give about his seminal stem cell discoveries in the late 1990s and early 2000s – to staff, scientists, to the public, to Congress, to the news media – he would explain why he came to UW-Madison in the early 1990s to try to advance embryonic stem cell research. In large part, he said, it was because we had a National Primate Research Center here at UW-Madison, and also that we had leading experts in transplant and surgery at our medical school. After he joined the WNPRC as a staff pathologist and set up his lab, first he used rhesus and then marmoset embryos before expanding to cultures using human IVF patient-donated embryos off campus with private funding from Geron Corporation in Menlo Park, California. 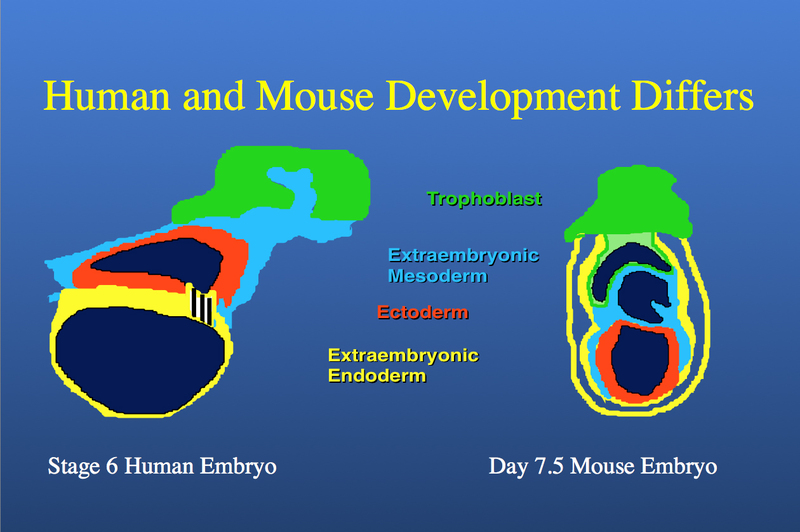 In these early talks, Jamie included images (see above) showing how very differently the mouse blastocyst (a days-old embryo, before implantation stage) is structured from the nonhuman primate and human primate blastocysts concerning germ layer organization and early development (ectoderm, mesoderm and endoderm). He also was able to show for the first time how differently stem cells derived from these early embryos grow in culture. In contrast to the mouse ES cells, the monkey cells, especially those of the rhesus monkey, grow in culture almost identically to human cells. 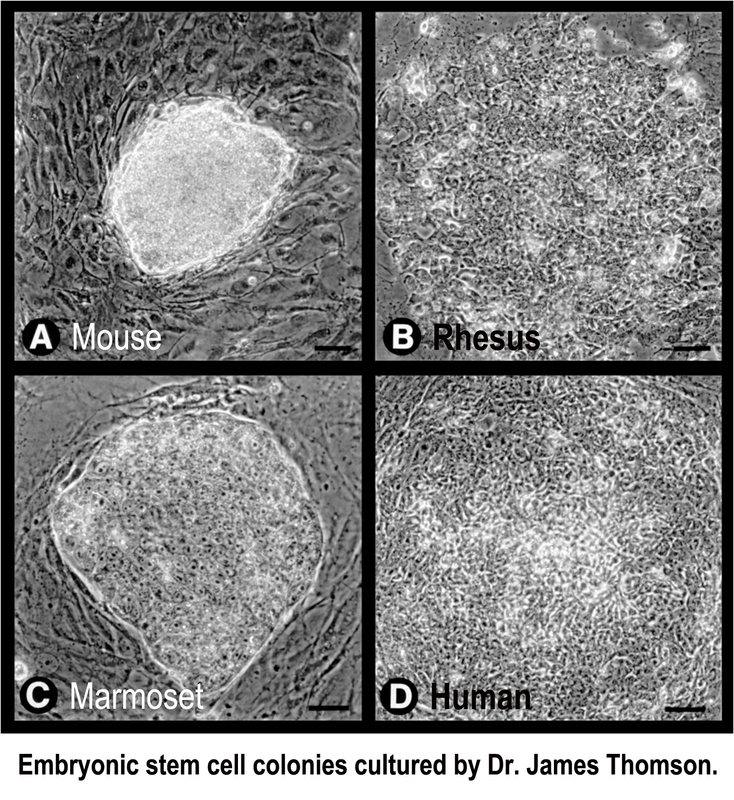 At the time, Thomson predicted that more scientists would study human ES cells in their labs over monkey ES cells, if human ES cells could become more standardized and available. Yet he emphasized that the NPRCs and nonhuman primate models would continue to play a critical role in this research, especially when it would advance to the point when animal models would be needed for preclinical research before attempting to transplant cells and tissues grown from ES cells. Both predictions have come true. This simply and elegantly reminds us how basic research works: Many medical advances another 20 years from now will have an important link to the discoveries of today, which have their underpinnings in that early research in Jamie Thomson’s lab 20 years ago. It will become easy to forget where it all started, when many diseases of today, if not completely cured, will become so preventable, treatable and manageable that those diagnosed with them will spend more time living their lives than thinking about how to survive another day. Just as I did not have to worry about polio, and my children did not have to worry about chicken pox, my grandchildren will hopefully see a world where leukemia, blindness, diabetes and mental illness do not have the disabling effects or claim as many young lives as they do today. Don’t miss this fascinating talk covering stem cell milestones at the UW. Professor Murphy will talk about the work of his team at the Stem Cell and Regenerative Medicine Center, where they are creating biological materials that could radically change how doctors treat a wide range of diseases. Bio: Murphy is the Harvey D. Spangler Professor of Engineering and a co-director of the Stem Cell and Regenerative Medicine Center. His work includes developing biomaterials for stem cell research. Specifically, Murphy uses biomaterials to define stem cell microenvironments and develop new approaches for drug delivery and gene therapy. His lab also uses bio-inspired approaches to address a variety of regenerative medicine challenges, including stem-cell differentiation, tissue regeneration and controlled drug delivery. Murphy has published more than 100 scientific manuscripts and filed more than 20 patent applications. Posted on January 7, 2015 January 8, 2015 by EditorPosted in Guest Post, Science NewsTagged animal research, animal testing, hESC, James Thomson, Jordana Lenon, monkey, mouse, National Primate Research Centers, stem cell, University of Wisconsin-Madison. Previous Previous post: 2015 – The Year of the Science Communicator! I’m an outsider and this whole concept of stem cells is new to me. I heard them from Dr. Sammy sliwin’s clinic in Toronto, when I visited the surgeon, with my wife, to have her liposuction procedure. I read an interest article about the same, in their site sliwinplasticsurgery.com.